Amazon Affiliate Site (WP Zon Builder/WP ROBOT versions) in great ElegantThemes eStore theme! | Best Amazon Affiliate Themes And Plugins Ever Seen! 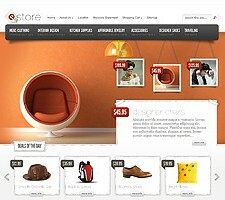 Home » Great ET eStore theme! Make it simple to create and maintain a great site with Outstanding eStore Theme now! Theme installation, configuration and adaptation is a hard work, but I`ve done it for you! 2. Theme php code modification and optimization. 3. Some WP Zon Builder modifications. 4. Many WP Robot modifications. 1. Does this theme fully automatic? eStore theme have been perfectly adapted and optimized to work with WP Zon Builder and WP Robot! Manual Posting supported as well! Yes! eStore theme have a fully customisable sidebar just like a regular blog. You can add whatever you like.